Similar to the Igloo Maxcold Backpack Cooler, the Outdoorsman has 25% more insulation. Therefore, you can keep your drinks and food colder for longer, and you don’t have to carry as many ice packs. The Igloo Outdoorsman Gizmo Backpack, however, has room for 32 12-ounce cans (vs 18 that the Maxcold can carry). In other words, you can carry significantly more stuff without having to lug around a cumbersome ice chest. The Exterior Features Make this Cooler Backpack Even Better. Because this backpack can carry more items, Igloo designed the pack to be more supportive and comfortable to carry. For instance, the flat back makes the bag sit comfortably on your back. Plus, they made the shoulder straps wide and added padding to them. On top of that, the adjustable straps have an extra waist band that fits snugly around your waist. This adds an extra level of support for those longer hikes and day trips. Speaking of long excursions, this pack features several outer side pockets as well as molle along the should straps. Plus, it comes with a carabiner. As a result, you can access water, small snacks, sunscreen, your phone and other small items without even having to take your backpack off. 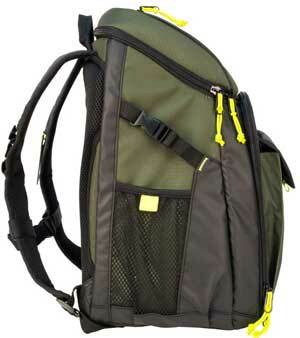 Just attach frequently-used gear to the outside of your pack rather than needing to carry it in your pants pockets. By the way, the majority of the backpack is dedicated to cooler space. However, the back side fo the pack does include a spacious compartment for dry goods. Need to carry a book, map, silverware or snacks that you don’t want to get squished by all of those cans? No worries! Stick them in that pocket. 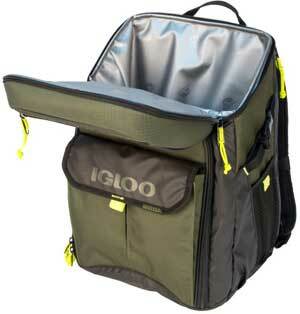 As you probably already know, Igloo makes a variety of different coolers and soft cooler backpacks. Their products typically last a long time and require minimal care. For example, their antimicrobial liner and leak-proof design help to minimize cleaning (and messes, for that matter). The antimicrobial protection actually make fabrics less susceptible to staining, bad odors and degradation. For cleaning, they recommend wiping down the pack interior after each use to prevent staining and odors. Simply use water and a mild detergent, or you can use baking soda to remove tougher stains. What Do I Think About the Igloo Outdoorsman Backpack? 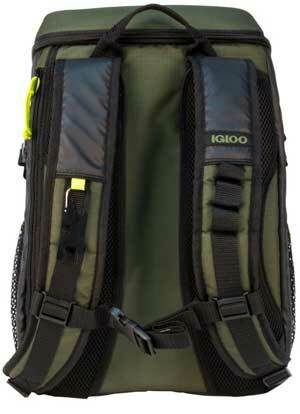 Overall, I am a fan of the Igloo Outdoorsman Gizmo Backpack. I admit this is partially due to its rugged look and design. That said, if you don’t need to carry as much gear, you may prefer the smaller Maxcold backpack cooler. It does cost about $15 less due to its size. 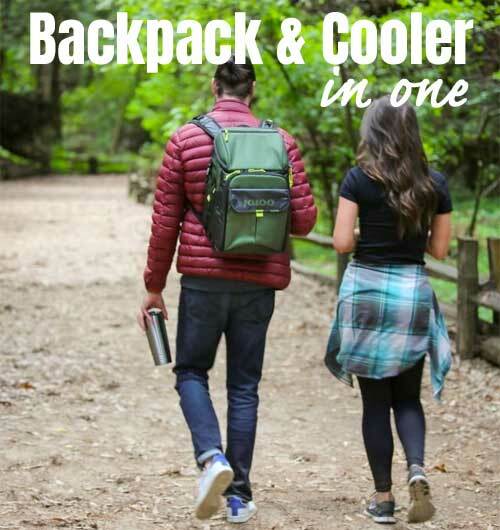 Backpack Lunch Cooler – Better than Insulated Lunch Bags?